2. 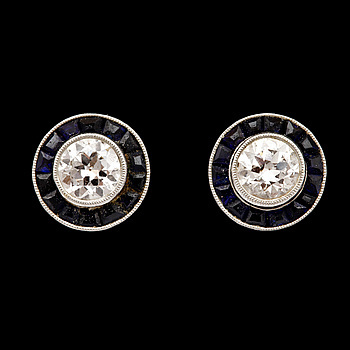 A pair of brilliant cut diamond and carré cut blue sapphire earrings, tot. app. 0.70 cts of diamonds. 3. 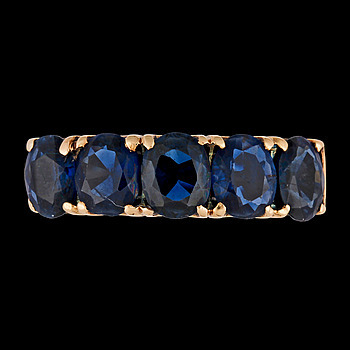 A five stonen blue sapphire ring. 4. A pair of cabochon cut Indian labradorite earrings. 5. 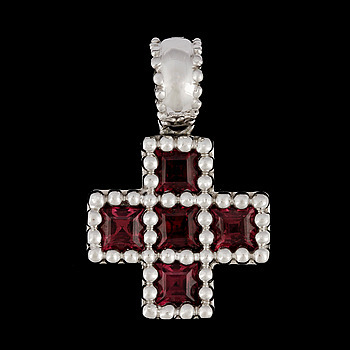 A tourmaline cross pendant. 6. A cartier brilliant cut diamond ring, tot. app. 0.40 cts. 7. A pair of moonstone, green and white sapphire earrings. 8. 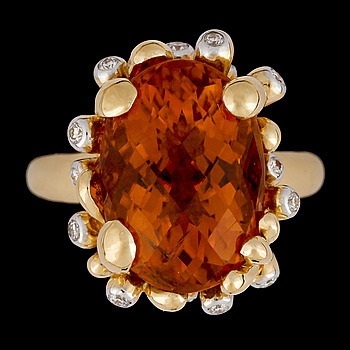 A citrine and brilliant cut diamond ring, tot. app. 0.18 cts. 9. 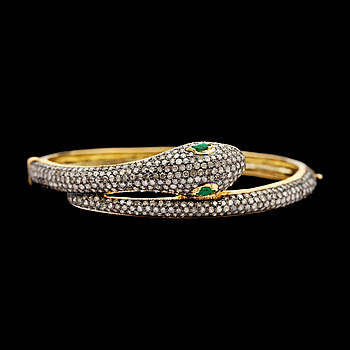 A rose cut diamond bangle, with eyes of tsavorites, tot. app. 4 cts. 10. A whtie agate and brilliant cut diamond rig, tot. 0.90 cts. 11. A white agate and brilliant cut diamond pendant, tot. 0.90 cts. 12. A green chalcedony and brilliant cut diamond brooch, tot. app. 2 cts. 13. A tsavorite, sapphire and white agate pendant. 14. 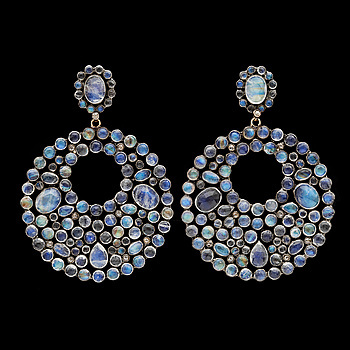 A pair of Bulgari Bzero1 earrings. 15. A natural grey pearl set with antique cut diamond ring, tot. 1.40 cts. 16. ÖRHÄNGEN, briljant- och åttkantslipade diamanter. 17. A pair of cultured and coloured brown South sea pearl earrings, 12,5 mm. 18. A cultured coloured brown South sea pendant, 12,5 mm. 19. A pair of cultured South sea pearl, 12,4 mm, peridotes, tot. 6.55 cts and brilliant cut diamond earrings, tot. 0.24 cts. 20. A cultured Tahiti pearl and tsavorite frog ring. 21. A cultured golden South sea pearl ring, 11,5 mm. 23. A Gübelin two coloured gold necklace, 272,7 g. 1960's. 24. A pair of brilliant cut diamond earrings, tot. 10.50 cts. 25. A brilliant cut diamond bracelet, tot. 5.28 cts. 26. An emerald cut diamond ring, app. 2.40 cts, and smaller, tot. app. 0.50 cts. 27. A brilliant- and baguette cut diamond and yellow topaz earrings, Art Deco, later topaz. 28. A cultured Tahitit pearl, 14,7-13,4 mm, necklace. 29. A threes stone diamond ring, tot. app. 1.90 cts. 30. A pair of brilliant cut diamond earrings, tot. 3.42 cts. 31. A cultured Tahiti pearl, 12 mm, and brilliant cut diamond, earrings, tot. 1.06 cts. 32. A pair of cultured South sea pearl and brilliant cut diamond earrings, tot. 0.60 cts. 33. A pair of brilliant cut diamond earrings, tot. 2 cts. 34. A pair of cultured fresh water pearl and brilliant cut diamond earrings, tot. 0.32 cts. 35. A brilliant cut diamond ring, 1.07 cts. 36. A Cartier Trinity ring, 1990. 37. A Cartier Trinity ring. 38. A pair of Cartier Trinity earrings. 39. A Certier Trinity ring. 40. A Cartier 'Trinity' necklace. 41. A cultured South sea pearl, 12,4 mm, and brilliant cut diamond ring, tot. 1.50 cts. 42. A heart cut peridote ring. 43. A heart cut blue topas ring. 44. A brilliant cut diamond pendant, tot. app. 0.75 cts. 45. A Gübelin cultured pearl and diamond brooch, app. 3 cts. 46. A brilliant cut diamond, 1.45 cts, and smaller app. 0.15 cts. 47. A brilliant cut diamond ring, 1.75 cts. 48. A pair of sapphire, ruby and diamond earrings, tot. app 1.60 cts. 49. 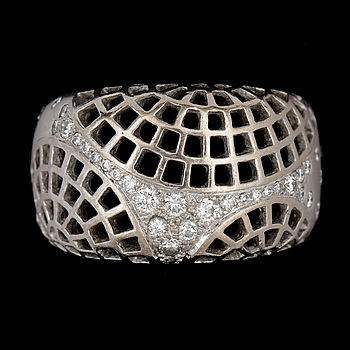 An antique cut diamond ring, app. 1.10 cts and old cut diamonds, tot. app. 1 cts. 50. A two strand cultured pearl necklace, 8 mm. 51. A butterfly brooch set with pink sapphires, tsavorites and cultured fresh water pearl. 52. A cabochon cut moonstone and sapphire ring. 53. A black and white brilliant cut diamond ring, tot. 3.40 cts. 54. A pair of cultured Tahiti pearl, 11,9 mm, and small diamond earrings. 55. A brilliant cut diamond, loose. Weight 1 ct.
56. BRILJANTSLIPAD DIAMANT, oinfattad. Vikt 0.78 ct.
57. A brilliant cut diamond, 0.75 cts. 58. A brilliant cut diamond, 0.74 cts. 59. Diamantgradering, A brilliant cut diamond, loose. Weight 0.68 cts. 60. A loose brilliant cut diamond, 0.30 cts. 61. A moons stone and orange sapphire ring. 62. An amethyst, brandy coloured diamonds, tot. app. 1.20 and blue sapphire ring. 63. A carré cut blue sapphire, 59 ct, and brilliant cut diamond bracelet, tot. app. 4 cts. 64. A blue sapphire and brilliant cut diamond ring, tot. 0.42 cts. 65. Two Hermés gold tassles, 28,6 g.
66. A pair of pink sapphire, tot. 3.83 ct, and brilliant cut diamond earrings, tot. 1.58 cts. 68. A blue sapphire, 4.70 ct and brilliant cut diamond pendant, tot. app. 0.60 cts. 69. An aquamarine, tot. app. 20 cts and diamond necklace, tot. app. 5 cts. 70. A brilliant cut diamond heart necklace, tot. 1.45 cts. 71. A blue sapphire and diamond pendant, tot. app. 0.90 cts, c. 1925. 72. ÖRHÄNGEN, odlade South sea pärlor. 73. A charm bracelet, gold coins Oscar II. Weight 65 g.
74. A gold charm bracelet. Weight 48 g.
75. A Spanish gold coin bracelet, weith 28 g.
76. A pink and blue sapphire, tot. 2 cts, and diamond ring, tot. 0.25 cts. 77. A pair of cultured pearl and diamond earrings, tot. app. 0.60 cts. 78. An amethyst, 4.85 cts, tsavorite, app. 1 ct and brilliant cut diamond ring, tot. 0.27 cts. 79. A pair of sapphire, tsavorite and cultured South sea pearl earrings. 80. A blue cabochon cut sapphire and brilliant cut diamond ring, tot. app. 0.35 cts. 81. An amethyst and brilliant cut diamond pendant, tot. app. 1.50 cts. 82. An old cut diamond, tot. app. 0.40 cts and ruby ring, Strömdahl Stockholm. 83. A ruby, 0.76 cts, and baguette- and brilliant cut diamond ring, tot. 0.67 cts. 84. A charm bracelet. Total weight 74 g.
85. A charm bracelet, weight 17,5 g.
86. A koral, pearl and brilliant cut diamond brooch, 1970's. 88. An antique cut diamond ring, tot. app. 1.50 ct.
89. A cabochon cut blue sapphire and brilliant cut diamond ring, tot. 0.45 cts. 90. A cultured Tahiti pearl necklace, 15,5-13 mm. 91. A pair of culture pearl, iolites and brilliant cut diamond earrings, tot. app. 0.50 cts. 92. A pair of cultured Tahiti pearl and brilliant cut diamond earrings, tot. 0.62 cts. 93. A three strand cultured pearl necklace, 9 mm. 94. A pair of brilliant cut diamond earrings, tot. 3.29 cts. 95. A rose cut diamond dog brooch, 1930's. 96. A godl heart pendant, c. 1900. 97. A pair of gold earrings, c. 1900. 98. A mabe pearl and brilliabnt cut diamond ring, tot. app. 0.18 cts. 99. A gold and brilliant cut diamond necklace, tot. 1.80 cts. 100. 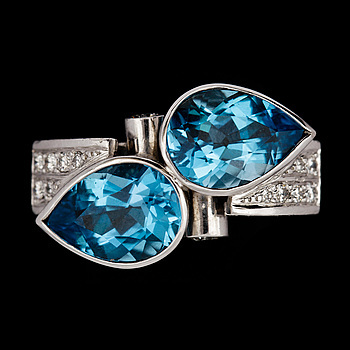 CLASP, brilliant- and eight cut diamonds, tot. app. 1.20 cts. 101. 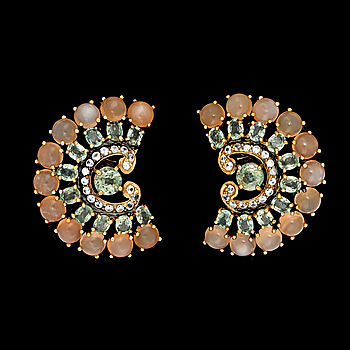 A pair of antique cut diamond earrings, tot. 3.45 cts. 102. A cabochon cut garnet and pearl brooch, c. 1900.